Settling down doesn't mean settling for less. 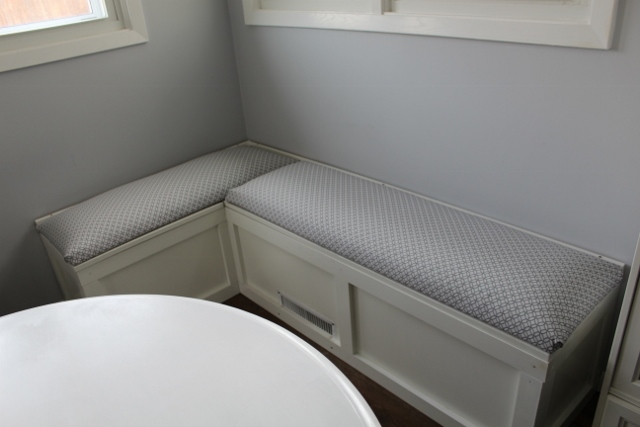 One of our last big kitchen projects was making a built in bench for our kitchen nook. I want to remind you of the before. This is how the space looked on inspection day (sorry for the bad lighting and off center photo). Here’s how the space looks today. Since the post is about the built in bench, maybe I should give you a close up of it. I have to give all the credit for this project to Dan. He consulted a ton of tutorials on building bench seating, measured, re-measured, and came up with a rough design for the L-shaped seating. My only ask was that the seat lifted up and allowed me even more storage space. Dan made it happen, even with the complication of there being both an electrical outlet and an air duct where the seating was. For the outlet, it’s still in there. We just don’t usually use it. For the vent, Dan cut some ducting and extended the duct to the front of the bench, where he installed a new register. 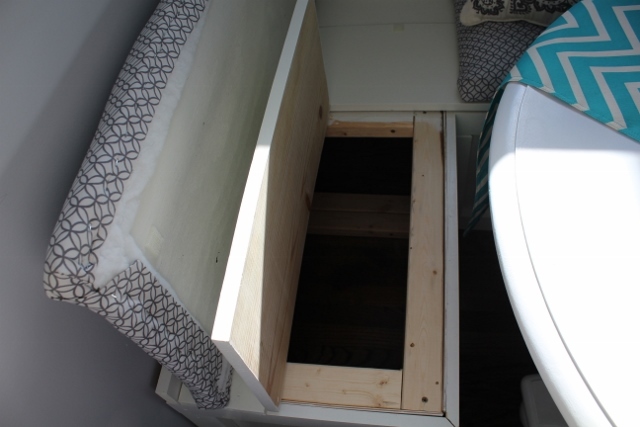 Hinges allow the seat to lift up, where I put in a bunch of storage totes I purchased at Target to hold miscellaneous, and not often used, kitchen supplies like seasonal cookie cutters, specialty baking pans, and the like. We made the seat cushions ourselves as well – can’t you tell from the photo? We started by cutting plywood to the length needed. We cut 2 inch foam to the same length, and glued it to the plywood with Liquid Nails. Then, we flipped each cushion over, laying some batting underneath. We pulled it tight (I even stood on the cushion, smushing down the foam, to get the batting as tight as possible), then used a staple gun to secure it. We did the same thing again with the fabric. We knew we’d need the cushions to be moveable from the bench, so we could get into the storage. I was concerned the cushions would slide around if we didn’t attach them though. Dan thought up a great idea and used velcro tape on the bench and the cushions, so the cushions would stay put. For now, I put some grey and white pillows (from our apartment bedding set that we no longer use) in the corner of the bench. Eventually, I’d like to get more matching pillows so the eating area is cozy and inviting. Maybe I’ll even make a cushion for the back part of the bench, so you’re not sitting against the hard wall without any padding. So do we actually use the seating? I’m happy to say that we do. Not everyday, but we seem to find ourselves enjoying our weekend coffee and breakfast sitting in the nook, catching up from the past week, and just taking our time in the morning before our day begins. 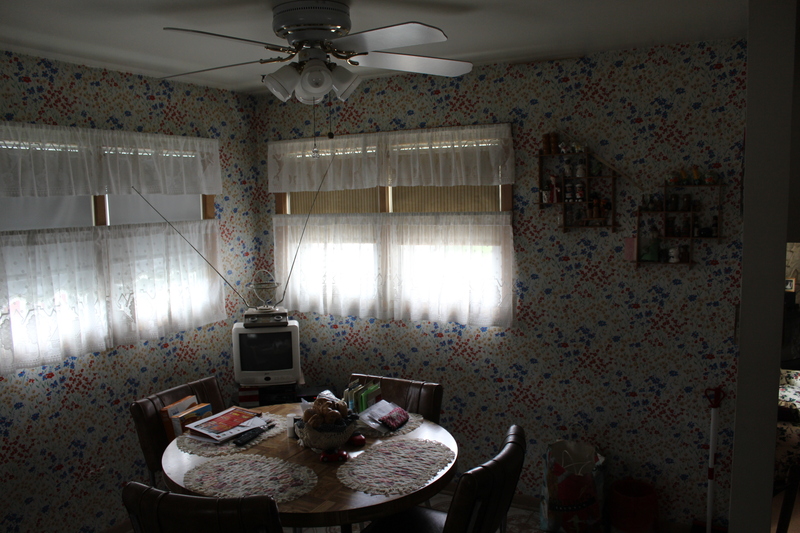 Plus, whenever we throw bigger family parties, relatives (especially kids) find their way into this cute little space. 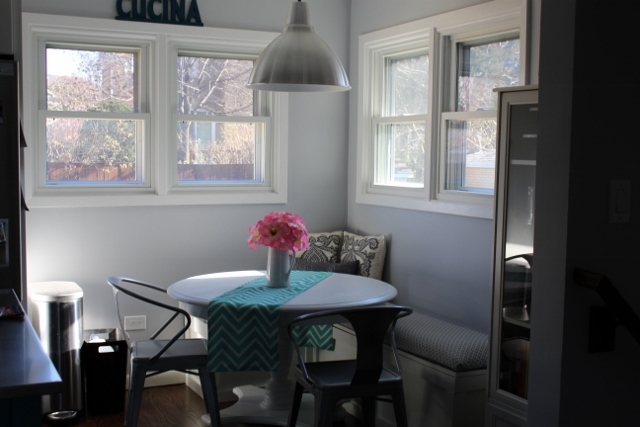 It’s a comfortable little corner of our kitchen that I’m so glad we took the time to build. Cindy Thorne on It’s Fall!